What follows is meant to mimic Weiner’s article by using the same data and quotes to reach a 180° opposite conclusion. It starts with the very title. Weiner concludes “studies show the split into two states would likely be an economic disaster for Upstate New York, experts say. The region simply depends too heavily on taxes and fees paid by wealthy residents and corporations in New York City and its suburbs.” I’ll present his very same arguments, with very little additional information, and come to a completely reverse deduction. Weiner present five separate points to support his thesis that “Upstate” New York cannot afford to separate itself financially from “Downstate” New York. For the purposes of our piece here, we’ll focus on the Greater Western New York Region rather than the broader “Upstate” region. Indeed, while Weiner uses Friedfel’s quote as additional proof to his notion that we stand to lose money if we break away from New York State. In fact, rather than exposing the problem, Friedfel actually reveals the solution. I spoke with the New York Association of Counties while fact checking Weiner’s story. Did you know that unfunded mandates imposed by Albany on every county represents nearly 100% of all county tax revenues? This leaves little for counties to spend on their own unique needs. It’s possible, perhaps even likely, that this $14 billion gap (it’s less for the Greater Western New York Region) can be erased by restructuring or eliminating mandates. We may find we’re leaving billions on the table once we remove the mandates New York State has been, in effect, bribing us to follow. This could represent an undiscovered financial bonanza. While this is related to subsequent points, it’s clear non-economic policies coming out of Albany, based primarily on the overstated influence of legislators from New York City, have created impediments to economic growth in our region. While these policies may have a home in the downstate megalopolis, they do more harm than good here. For example, how much growth did we miss because of the State’s attitude (and outright ban) on fracking? That restriction did more to harm regional economic growth than the State-financed “Buffalo Billion” did to help us. For that matter, New York State rules make it increasingly more expensive to employ workers. Businesses, especially small businesses (who the state refuses to exempt) can no longer afford to employ people at the same levels as in the past. Look no further than the $15/minimum wage. Not only are companies rethinking their personnel strategies, but they are lopping off entire business units (for example, see the closing of Mark’s Pizzeria franchises). The real problem here is our shrinking population. This isn’t a new problem. It’s been around for more than 60 years. Perhaps there’s a reason why people are leaving? (Spoiler Alert: It’s not the weather.) Clearly state policies aren’t working. What works for New York City does not work for Western New York. The facts continue to support this, even if Albany refuses to recognize these facts. We may not really know who coined the adage “Insanity is doing the same thing over and over again and expecting different results,” but it may certainly could have been a fly on the wall overlooking the so-called New York State “brain trust.” Again, what works for New York City does not work for Western New York. For the record, Greater Western New York has 14 SUNY schools, including the University of Buffalo which appears to be slowly evolving back into a Division I private university. It has 15 prisons, including 5 of the State’s 17 Maximum Security prisons. The fact that most of the students and prisoners come from outside the Greater Western New York Region does more to support the idea that becoming our own state would be a financial bonanza. There’s no reason why New York State could not continue to support these students and prisoners. More to the point, this represents a good model to transition Greater Western New York from the New York City-Albany captivity to one of true independence. 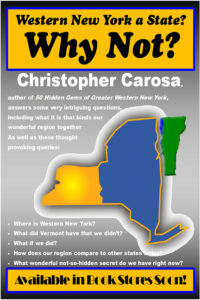 It would start with creating an autonomous union of the traditional post-Revolutionary War territory of Western New York (i.e., the 17 western-most counties, all of which either contain or touch the Preemption Line of 1786 – see “We Preempt Westward American Expansion for…” for 50 Hidden Gems of Greater Western New York). As an autonomous region, we would still be affiliated with New York State and certain assets (like the aforementioned schools and prisons as well as the transportation and energy infrastructure) would continue to be operated on a “joint venture” basis. All other policies, rules, and regulations would be subject to a terminal sunset provision long enough for the new autonomous government to reconsider their relevance and, if necessary, replace them. The solution is to live and let live. New York State should allow the Greater Western New York Region to form an autonomous provisional government that would act as a division within the framework of the existing state. If we can prove our value as an autonomous unit – and I believe it truly will be a financial bonanza – then when the Federal government is ready to restructure its configuration of states, we’ll know we’ll have an independent seat at that table – one that won’t require the approval of New York City or Albany. And that will yield riches beyond our wallet and into our very hearts. 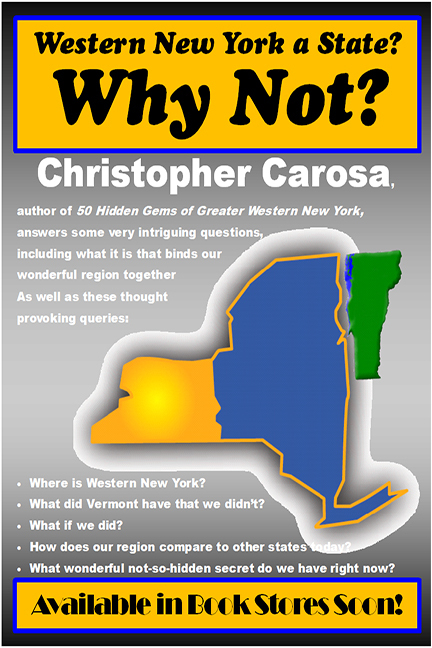 Would you like to ride along as Mr. Carosa explores centuries-old documents and newspaper stories for his upcoming book Greater Western New York a State? Why Not? Click here to sign up for his email list by registering on the site StateOf.GreaterWesternNewYork.com to receive periodic updates on his research and findings, notifications regarding speaking engagements, and, most importantly, when the book will be publicly available.